Plean Country Park is over 70 hectares of publicly accessible woodland, wilderness and parkland, with a network of paths for walking, cycling or horse riding. There are toilets and a new play park. Open all year during daylight hours. 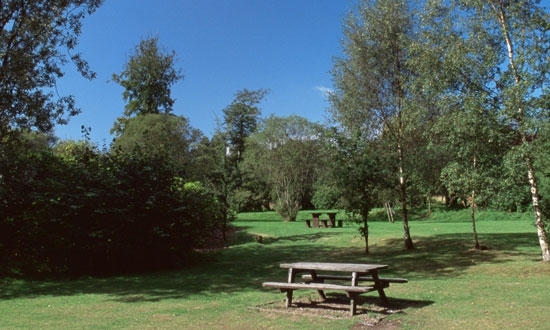 Plean Country Park is an area of over 70 hectares of diverse parkland and woodland owned by Stirling Council and open to the public all year round during daylight hours. In January 1963, the last pit in Plean closed. In the mid 1980's, after years of neglect, British Coal handed over the now derelict Plean House and 190 acres of land to Stirling Council. The paths and the main drives were completely overgrown when work on the park started in 1987. The area has now been transformed into 200 acres of woodland and parkland with way marked walks, an orienteering course and a biodiversity trail. Eighty different species of birds can be spotted and roe deer, rabbits and foxes roam freely. There is a walled garden which was previously used by residents of Plean House to grow their own fruit and vegetables but is not open at present to the public. There are a variety of woodland walks and a horse trail at 4km in length being the longest trail around the park. The core paths laid mostly with tarmac are suitable for the disabled and lead to the picnic area where new picnic tables are suitable for wheelchair use. Older children can have a great time running around, playing hide and seek and building dens while children of all ages can enjoy the newly opened rustic playground. Snowdrops and daffodils cover the park in Spring, red and blue rhododendrons burst forth in Summer. The Wildflower Meadow has a large variety of wild flowers including the Greater Butterfly Orchid which flowers in early July. The fenced-off ruins of Plean House stand in the middle of the park, as a reminder of the park's history. A commemorative sculpture stands near the walled garden as a tribute to local miners who worked the pit seams and in memory of those who tragically lost their lives, in the 1922 pit explosion. The park has a natural wildness and on the paths and trails you can feel like you are the only one there. No cafe or gift shop but there are toilets and a recently constructed rustic children's playground makes it suitable for a great day out for all the family. Various events are organised throughout the year including Family Fun Days, special Park Ranger nature days, demonstrations and other events run by the Friends Group. Keep an eye on the What’s on around Stirling pages and if you would like to find out more about the park or the Friends Group visit www.pleancountrypark.org.uk or contact the Stirling Council Ranger Service.